HERO is the ultimate HTML5 Icecast & Shoutcast Radio Player With History support. We have provided over 30 js options from where you can customize your player, including: width, autoplay, colors and other parameters. Great player ! I asked for the https feature. They realized this in a couple of days. Great !! Thanks again ! Best radio player yet, amazing support also. Quick to response to support requests, and blazing fast bug fixes when requested. I think this has to be our best buy on Envato to date all because of Hero radio player! P.S. 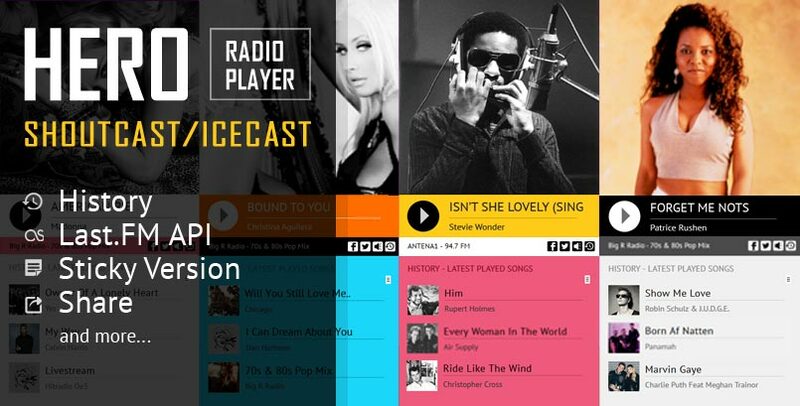 HERO – HTML5 IceCast & ShoutCast Radio Player With History is included in IceCast and ShoutCast HTML5 Radio Player jQuery Plugins Bundle The bundle contains 3 Radio Player jQuery Plugins. You can purchase this package with a substantial 55% discount!